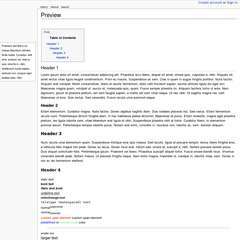 The Monobook theme is an attempt to emulate the feel of the Monobook skin on the Wikidot platform. This theme disables the placement of [[module Search]] in the main section and also disables the ability to search content in the built-in forums. Why is there a garbled text on the top of the wiki? This theme uses Heading 2 to display text in that spot. Multiple entries stack text there. Important: The author is no longer supporting this theme. He has inflicted himself with selective amnesia, and can no longer recall anything about this work. Do not contact him for questions and support. Visit http://community.wikidot.com/ for help instead. Thanks for the style! I love simplicity and your style delivers it. But I would abandoning the top menu and move edit buttons to its position. People like me, who use Wikipedia often will find it familiar and therefore simpler. Others are others and me is me. this is a forum signature. really. I would position in to the top (just under an optional header image or something). 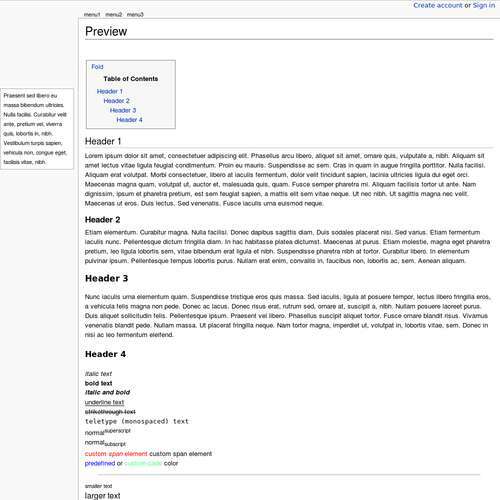 Maybe not conforming to Wikipedia style, but still simple and clean. Other than that, really nice. … or set display:none to the default searchbox, and explain how to put [[module Search]] to the sidebar. Thanks, will probably do that. It will also allow people to try it out using the default "How to Install" instruction. The theme looks very clean and professional. Thanks! Am unable to find how to add logo on this theme? Any help on this please….. If you read further down this thread you'll see that Fereal has given instructions. And further down still is a post from Ed Johnson with alternative instructions for adding the logo into the sidebar instead of the header. Remove the [[code]] in the Searchbox update, so that CSS code is the first code block on the page. My wiki logo isn't showing up. I'm pretty sure I followed all the instructions correctly. Can someone please provide troubleshooting tips? Thanks! You've made your site 'Creativity' private, meaning no-one here can look at it to see what's wrong. I can't find the logo installation instruction in the advanced documentation. In fact, when I clicked on the link for advanced documentation, it says the page does not exist. Help please? Thanks. Either add that at the end of the CSS or edit that entry (it's blank). 150x150 pixel logos are allowed, though you can edit the positioning and size to allow a larger or smaller logo. You can also use the CSS module and put the above in your navigation sidebar. "Don't bother asking questions about my theme as I won't answer them". It's a shame this has been discontinued. I really wanted to use it and start a site for crafts. Thanks for posting the new location.